These are a few of the bits that I cut from the main video because it was too long, including running it at full speed and a comparison with a super-simple system! There’s a strobe light in this video, too. You might want to watch part 1 if you haven’t already, so that this makes more sense. I threw this together from an old toy’s motor, old printer’s iR sensor, pizza box and some other things, to try out the PID controller algorithm after discovering it on Wikipedia and seeing that there was pseudocode, meaning that I didn’t have to get a PhD in mathematics to be able to read the crazy-looking formulas that Wikipedia seems to be so fond of. There’s a strobe light in this video. Here, the PID controller is trying to keep the motor at a precise speed (and get it there as quickly as possible). It doesn’t work well half the time because the L298 (H-bridge), responsible for switching power to the motor, doesn’t seem to like making the motor brake. That means it speeds up much more quickly than it slows down, which the algorithm doesn’t like (it’s designed for linear systems) – it basically ends up trying too hard to slow down, resulting in a big undershoot. I might be able to somewhat compensate for that in code. I might try this with a Sabertooth motor speed controller (as used in my old singing motors project) in place of the L298, which can certainly force a motor to stop spinning, but the Sabertooth gives such a boost to the motor to get it up to speed that 90% of the PID’s job becomes redundant… Oh well, at least it’d be able to hit any given note without me having to calibrate it first like I did with the singing motors. By the way, that’s why this system measures speed in Hz – I originally intended for it to play music like a new kind of “singing motor”. Part 2/2 will show it running at full speed (with a more powerful PSU), show a much more naïve speed controller algorithm for the lulz, and just clear up a couple of details. This time, I didn’t throw away or dismantle everything in the video! I did thoroughly rearrange whatever remained afterwards, though. I was cleaning out my room and found a load of random stuff (mostly toys), and some of it was interesting, so I decided to record it. Some of it’s around 14 years old. I didn’t intend for 50% of the video to be about Beyblades. Here, I conneced a solar panel (via a transformer) to a sound interface as if it’s a microphone, to reveal the subtle pulsing and filckering of various light sources. If you don’t like 50 Hz, this video isn’t for you. Thankfully, the infrared light from my camcorder is apparently very clean (not pulsing), so I can use that to see things in the dark without affecting the sound. The transformer is just designed to convert 230V AC to 12V DC, so its audio properties are not very good (it muffles things a lot). Ideally, I’d be using an audio transformer that’s designed to sound good, but this is all I had available. I am using it to remove the DC current that the solar panel makes, because I don’t fancy putting 17.5V into my Quad-Capture (sound interface)’s mic input. I originally tried to make a high-pass filter to remove the DC, using a capacitor and resistor, but it only worked until the capacitor became fully-charged, at which point the sound faded. It was much clearer-sounding than the transformer, but there was also a huge amount of background noise. I want to revisit this idea in the future, especially to take it for a drive at night, listening to the street lights and car lights (since modern cars use PWM to dim the tail lights). 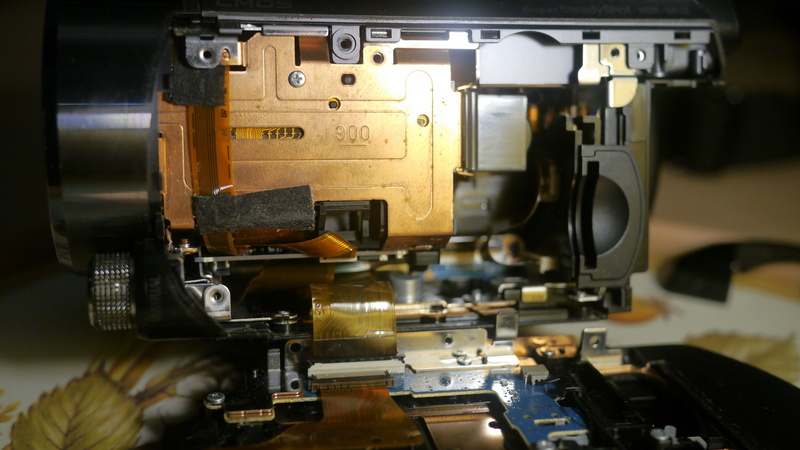 Since my camcorder’s HDD is finally giving up (after about 5 years), I took the opportunity to open it up and take a look inside it – and, of course, I took a bunch of photos as I went along. I did not delve deep inside it because I intend to keep using it after replacing the HDD, and I didn’t trust myself to remember how to put it all back together, but hey, I thought some people might think that it looks cool. I didn’t make a video, because it was such close-up photography that I had to use a macro lens most of the time, and lighting was such an issue that I had to have my camera’s aperture fully-open. This means that the depth of field was extremely shallow, which would’ve been extremely annoying in a video (95% out-of-focus), and, to top it off, the lens doesn’t even have any image stabilisation, so it would’ve been motion-blurred, too. A YouTube video would’ve been cool, but for now, please enjoy the photos! 24 more photos are below the page break! Headphones are recommended for the noise reduction demo. The waveforms displayed while Dolby is selected are simulations – versions of the original audio processed by a compressor/expander. In reality, Dolby mostly only affects the treble (as you can hear), since that’s where most of the tape hiss is, so you wouldn’t get big low-frequency waves, but hey, it’s easier to visualise this way. My usual video editor did not feel like working, so I made this entire thing in Avisynth – it’s like coding, but for video. Please kill me now. Well, I used VirtualDub for the cropping out of all the dead air, my failures to speak, and misinformation which I said by mistake. On the plus side, I learned a lot of stuff by editing this way (such as how badly Avisynth is designed regarding modifying audio). Also, I didn’t have to screen-capture anything to get those waveforms – they’re being made in realtime by the Waveform plugin, which is processing audio from different Dolby simulations which are also being made in realtime by SoxFilter‘s “compand” function. This video didn’t turn out as well as I would’ve liked – from the poor view of the mechanism to the incomplete demonstration of the functions and different tape types, and the fact that the only time I could record this (free of disturbances and noise) was a 45-minute slot was when I was half-asleep. So, if people are interested, I might re-visit this. I’ve given her another 2 ultraound sensors on either side, so that she can see how well lined-up she is to walls on either side of her. This is to try to keep her heading directly towards a wall, so that the head ultrasound sensor will get the best reflections possible (assuming that her environment uses lots of right-angles). The Arduino fires all 3 ultrasound sensors and listens for their echoes at the same time in order to “see” at the highest frame rate possible (typically 20-50 FPS), but this causes issues with echoes from one sensor bouncing around and returning to a different sensor. Although the code avoids any clearly-bad echoes like this (e.g. 2 echoes on the same sensor), it’s far from perfect, and she often thinks that she’s crashed into something (an object is very close to the head) when she hasn’t. I think there’s also a strange bug in the function that times the echo delays, or something strange is going on with hardware interrupts, because the function sometimes returns 0 for a sensor which clearly has an object in range, and at the same time, the sound of the tone playing on the speaker (using the built-in tone() function) becomes distorted so that it doesn’t even sound like a square wave anymore. I’ve never experienced that before, and I have no idea what’s wrong there. Oh well, she looks cool aligning herself half of the time. Fun game to play: See how many inconsistencies there are in this video. It’s a combination of videos recorded 7 months apart.